Hello to all and – sorry for the long absence, but I took a little trip and my internet connection was at best sketchy and mostly non-existent. And then I got lazy due to catching a cold on the 33 hour flight back home in economy class and Jet Lag that I personally dealt with very very poorly. However, I do want to start to update everyone on the trip and how great it was. And it was great – although not all of it was great – but there were fantastic parts, and there were unexpected incidents. And there is the “anticipation expectation”; the events you were looking forward to that just don’t turn out exactly like you anticipated them. For instance, I convinced myself that sleeping in a tent, in the cold sub freezing night, without a shower for 9 days and 8 nights would be fine even though I am not a “camper”. Wrong; I really don’t know what possessed me to think that I could enjoy camping when I clearly do not… but it was part of the adventure. But this post is to start the tale of the adventure and to let everyone know that yes, we are back home. Safe, sound, and I must say a bit changed for the experience. I started traveling when I was in my early 20’s and every time I am re-introduced to the hardships of living in a third world emerging nation/country, I am reminded of how much I take for granted in the USA and how I am so very lucky to be a US citizen. Our timing was great – the first “polar vortex” of the season had come and gone by the time we departed and there were no delays at the airports we were traveling through. The trip started with a few teary good-byes from loved ones, and Kerry and I queuing up for the security line at the San Antonio Airport. Of course we were very very early and opted to get a beer before we boarded the regional jet to Minneapolis. Because delayed baggage is a true problem when flying to East Africa, we were advised to wear our boots and carry on our back packs, filled with all the necessities you could not do without for at least 2 days of the climb at which point the balance of your gear should show up and be brought to you on the mountain. For us that meant we carried on our full backpacks plus a “large” tote purse. Did you catch the “regional jet” above? We were really lucky that our packs fit in the overhead and our totes fit – barely – beneath the seat. Why? Because we barely made it to our connecting flight. Booking flights 8 months in advance is tricky. We must have received about 8 flight changes from the time we booked until we actually departed. Our connection in Minneapolis kept shrinking, but with 50 full minutes in a smallish airport we were both confident that it would be fine. Then of course, we fought 100 mph headwinds, and were late. The “smallish” airport is not so small when you have to run from a domestic to an international gate. We grabbed a cart and drove to the gate, without time to use the facilities or pick up any food. We were the last 2 people on the plane and they closed the doors behind us. Luckily, the flight to Amsterdam was not completely full and we found overhead space for our gear. We didn’t need food after all – the food on Delta/KLM on the international flights was actually decent. I’m not saying it was great, just decent. Plus, we had trail bars and our own snacks. We started our 8.5 hour flight to Amsterdam at 4:30 pm. We would arrive at 6 am. We were supposed to sleep! Not easy. In Amsterdam we had 3 hours, found a bathroom to wash up and found a spot with good coffee and breakfast. 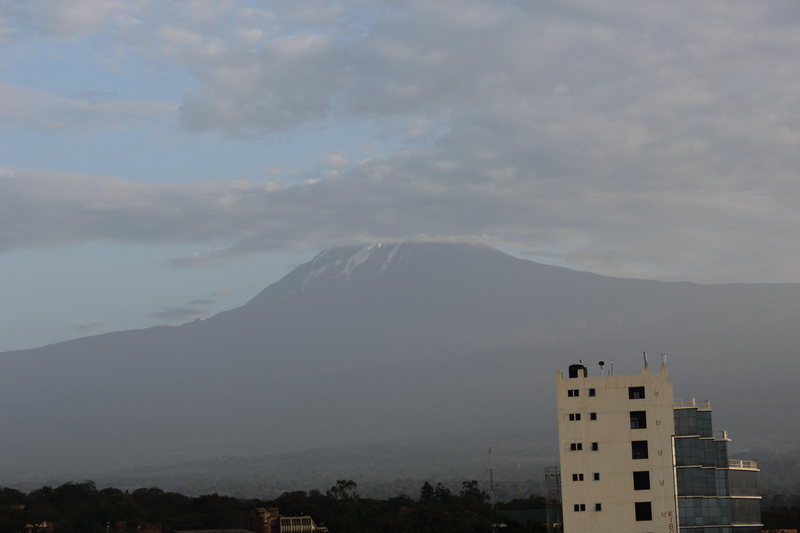 We checked on our bags which did make it to Amsterdam and we were confident they would arrive with us in Kilimanjaro. And by the time we did arrive in Kilimanjaro Airport we had eaten more food than I thought was possible in a 24 hour period: all in all, 5 meals plus 3 snacks. And very little sleep. The airport at Kilimanjaro doesn’t have jet ways, so you debark onto the tarmac and walk into the customs and immigration. First the line for the Visa (a crisp new $100.00 bill in US Currency please), then to station 2 where they ask you questions, then to station 3 where they take your picture along with your electronic finger prints. Finally you claim your baggage and meet your Tusker Driver and the whole process took only about 40 minutes. 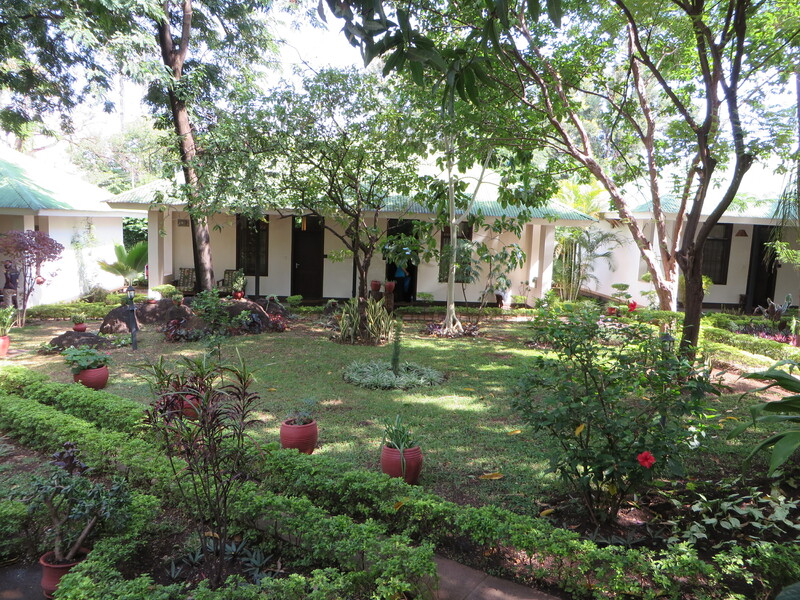 The 50 minute drive from the outskirts of Arusha to Moshi at night is not advantagous for sight seeing, but we do pass several villages (really only a collection of a dozen cinderblock houses), that all have at least 2 bars where the music is loud and the pool table is well lit. 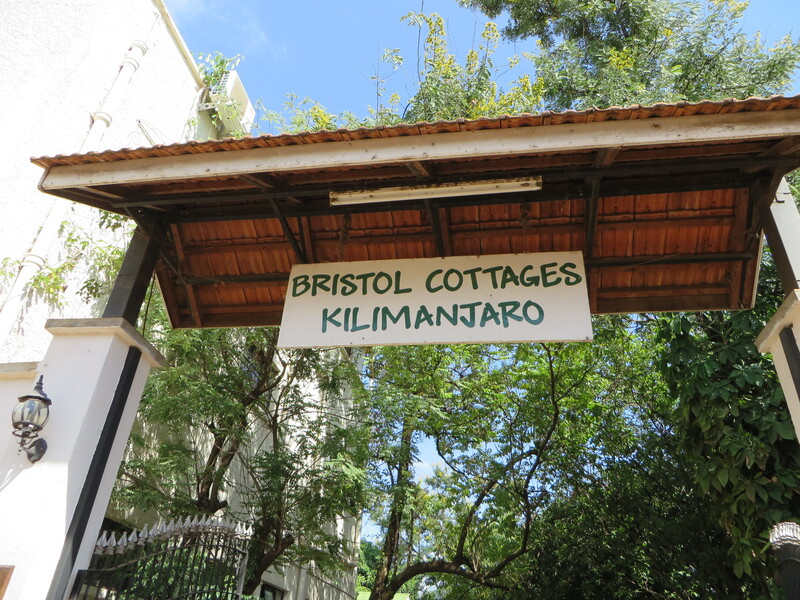 When we arrive at the Bristol Cottages in Moshi, we are offered dinner… food overload! But we are here!!! We have arrived, our gear has arrived! We have a brief meeting with Faheem, the coordinator, who tells us our program for tomorrow and sends us off to sleep. And I still cannot sleep. This will be a recurring theme, unfortunately. I think is this great that you are capturing your adventures in a blog, thanks for the update and the great pics.